Thursday, we are up at 5:30 am local time, showered and dressed and we head over to the IHOP which is just a 100 yards down the street. The service is good, the prices are high. We spend about $15 for breakfast (this was no delux breakfast). We go back to the hotel, and leave at 7:30 for Fisherman's wharf. Considering the rush hour traffic the evening before, and the need to find parking, we figure we better leave plenty early to make our 9:30 ticketed departure for Alcatraz. We are parked and walking around the wharf at 8AM, heavily overcast skies and the wind is blowing. We are soon looking for a place to get inside to keep warm. There's a gift and coffee shop right there at Pier 35, the departure dock for Alcatraz. So we spend almost an hour reading their books for free and Connie has a cup of hot chocolate. Finally we are on our way to "The Rock." 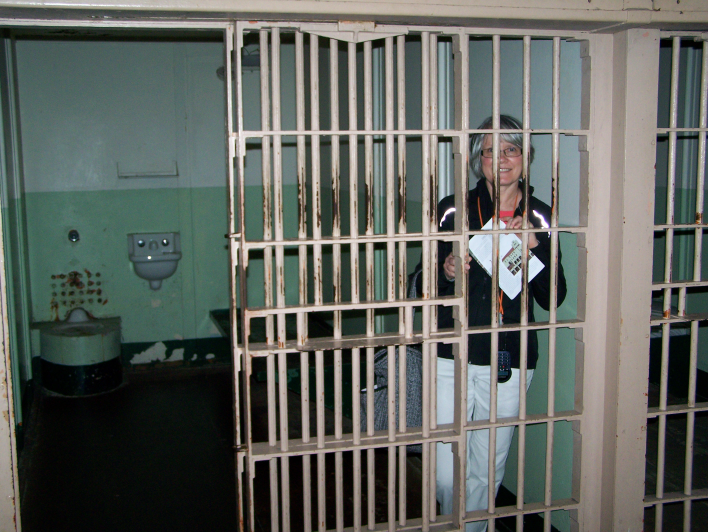 I've been in numerous prisons and had actually been to Alcatraz before, Connie has been in neither. We had a good time touring around. They opened the Model Industry building at noon and we spent some time there. I had not seen that on my previous visit. Back at Fisherman's Wharf for lunch at Eagle Cafe; traditional clam chowder in a sour dough bread bowl. It was filling and the warmth helped warm us up. It was still heavily overcast and windy outside about 59F. Just after lunch as we were walking down the street, we saw a couple of trolley cars on the street and the street went up a large hill. We both recognized this scene as classic San Francisco. 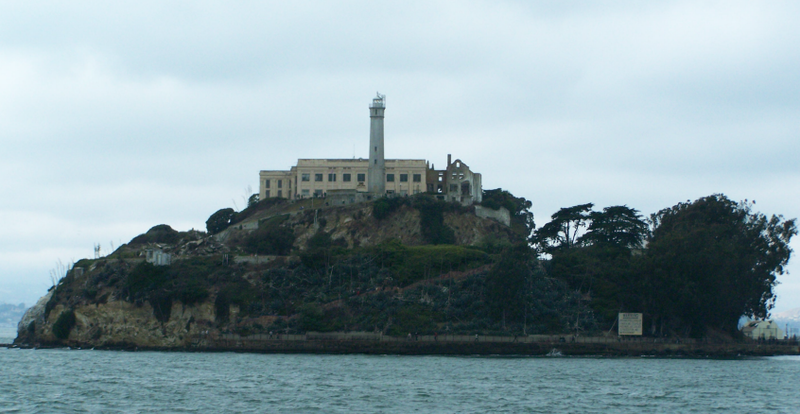 It quickly brought to mind those "San Francisco treat" commercials for Rice-a-Roni. I decided that at one of our meals, I'm going to ask for some Rice-a-Roni and see if anyone serves it. Ha! After lunch we headed on down the wharf looking for the tour bus office to exchange our voucher for actual tickets for the next day. 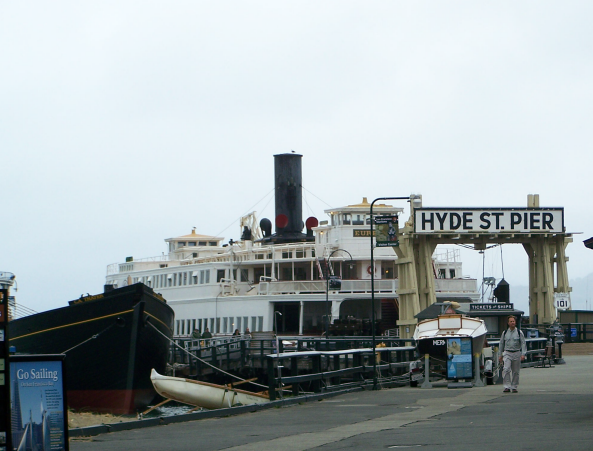 We passed by the pier where the SS Jeremiah O'Brien, a 1943 Liberty Ship (only one of two left in operation) is docked. We decide to tour it, and oh what a tour it turned out to be. 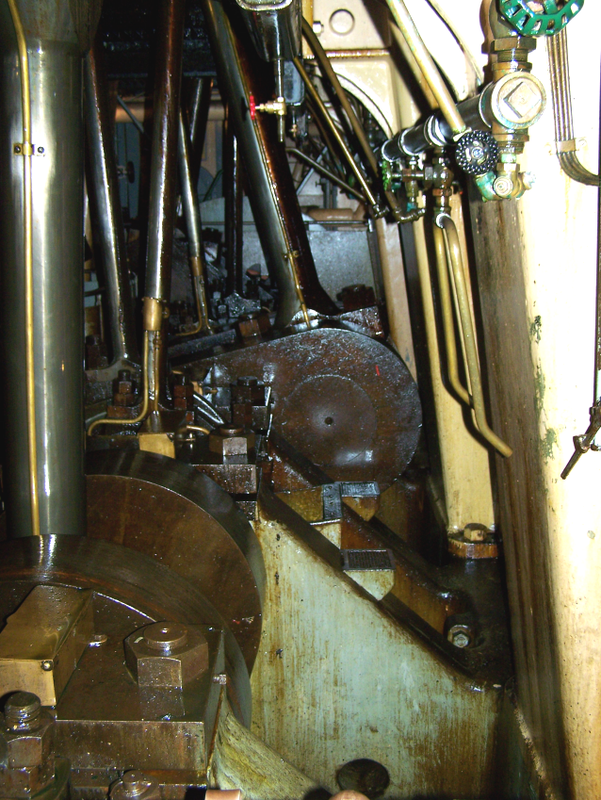 The tour includes the engine room. I was amazed that they let us into the engine room. It's a tight space with steep ladders going down about five decks, narrow walk ways and engine controls readily exposed. Remember, this is an operational ship, so anyone could monkey with valves or controls and they wouldn't know it. I've been on numerous ship tours and this kind of space is just not made available for tours. But we went all throughout the engine room. I was absolutely delighted and excited. Thrilled! There were volunteers working in the engine room as they had just completed a cruise the previous weekend for Fleet Week (just my luck to be three days late). They were drying out the boilers etc. to lay her up until next Spring when they have another cruise. 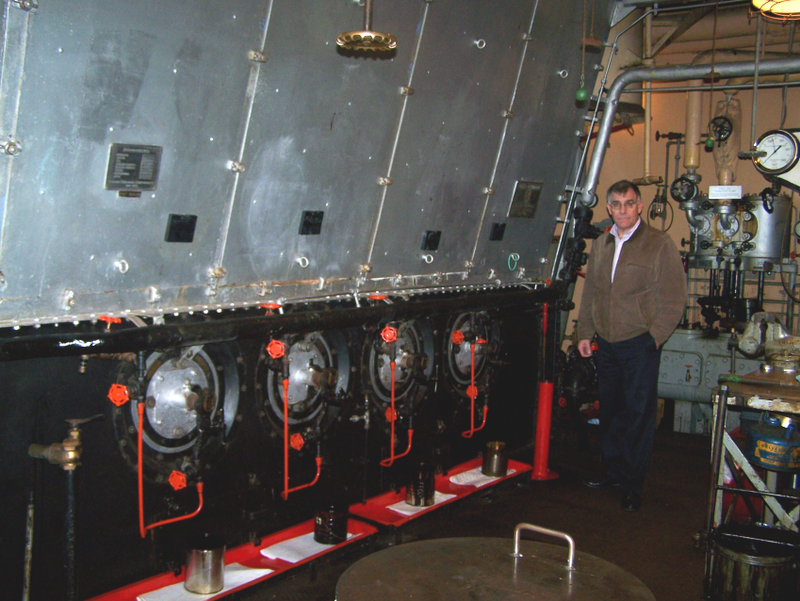 We learned that this engine room was used for engine room shots in the movie Titanic. So if you've seen the movie, you've seen the engine room, but not like I have. Most of the cabins, and there are many as the crew on the ship was as many as 43 men, were being used by the volunteers. The cabins were open for viewing and most of them filled with real people's belongings. So the tour was very much of an operational ship. After the Jere O'Brien, we walked on down the wharf still looking for the tour bus company. 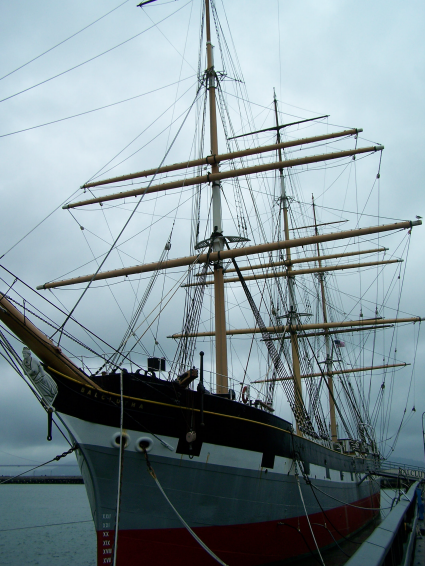 From various locations during the day, we could see the three masts of the square rigged Balclutha (AKA Alaskan Star). I told Connie I would like to just walk out the pier and have a look. Well, the Balclutha is part of the San Francisco Maritime Park which includes many boats of different sizes and boat building displays. You can tour all of the boats (that are tourable) for $5. 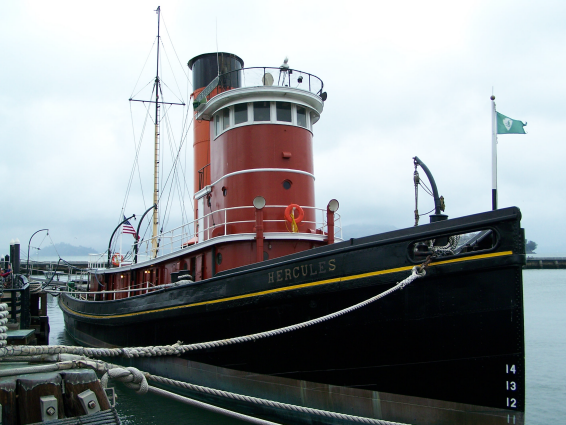 So I got to tour the Balclutha, Hurcules (ocean going tug) and Eureka (San Fran auto ferry). Connie was excited to see the sea lions laying on the dock just across the way from the pier at the San Fran Maritime Park. They were barking periodically adding to the nautical ambience. Sea lions laying about on the adject docks. We were back in the car at 6PM and drove down the Embarcadero and found a Subway (we were ready for some less expensive food). We ate in the car and listending to the vice presidential debate and drove to the Presideo Park. We drove around in the park, mostly in the dark and then came back to the hotel.